Not quite at the water’s edge, yet. 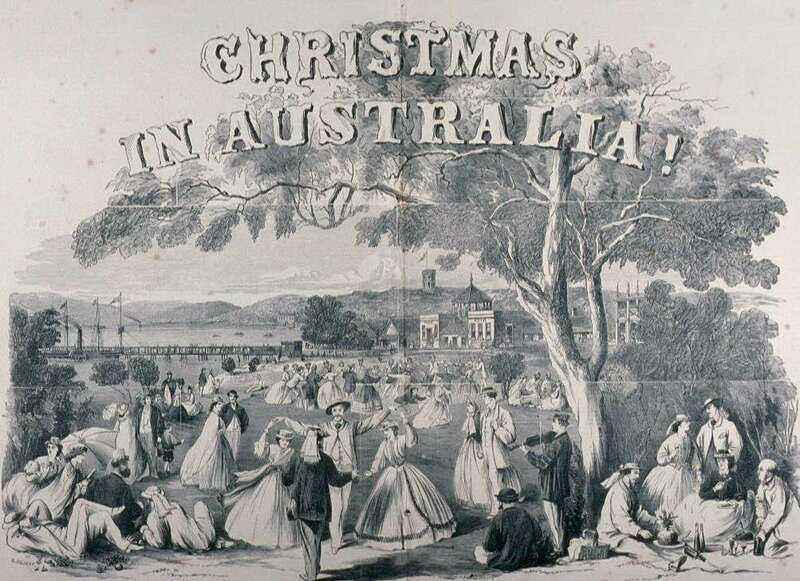 This 1865 depiction of colonists at Manly celebrating Christmas appeared in The Illustrated Sydney News. Image: ANMM collection 00006061. It was bound to happen. There was only one this year: a lone Christmas card arriving in my mailbox, stoically spreading Christmas cheer and best wishes for the season. Likely, next year there will be none and although we may discover new ways to spread cheer, via emails or seasonal emojis, but for me, the demise of the Christmas card is cause for some lament. The ideology of the Australian beach Christmas beginning to be entrenched. 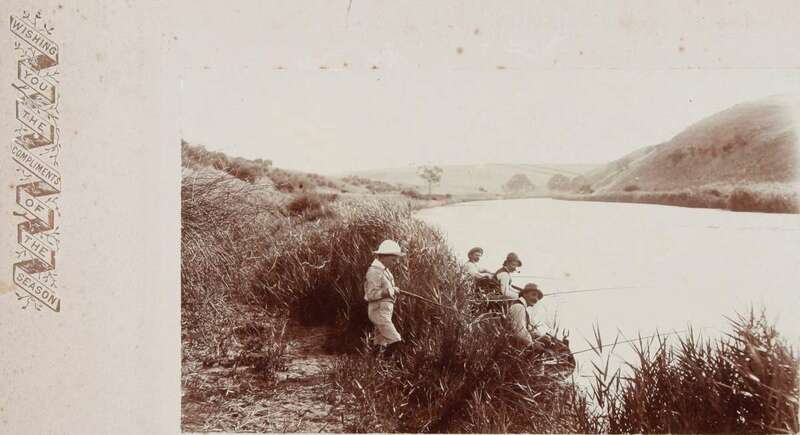 ANMM collection 00039786, c1905. The museum has a collection of Christmas cards, that in addition to being a poignant reminder of their long gone senders, inadvertently tell a social history of colonial Australia. There is nary a pine tree, bell or snowman to be seen. European settlers realised early on that celebrating the holiday with traditional accompaniments didn’t fit with an Australian summer and they quickly embraced Christmas by the water. Credit for creativity to this Christmas card celebrating Cairns from around 1930. ANMM collection 00044547. Residents and immigrants used Christmas cards to send love and wishes back ‘home’. These utopian scenes did as much for tourism and immigration to Australia as they did in spreading Christmas cheer. 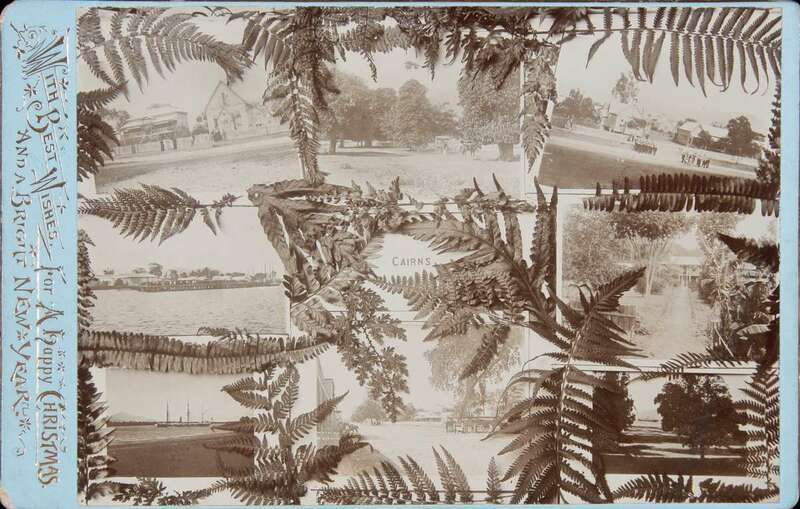 Beachside ‘bathing’ scenes were a popular topic on the cards as were water sports such as rowing, fishing and sailing. We were becoming a nation of maritime lovers in as many ways as we could. No snow or ice fishing here! 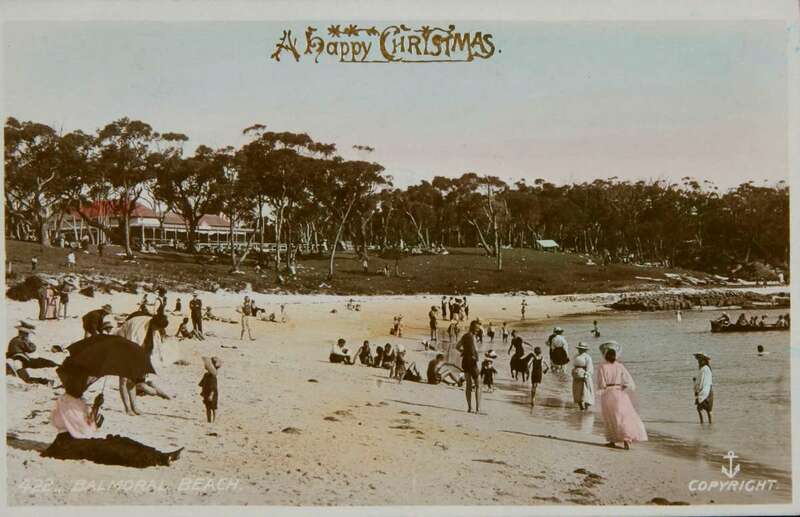 Christmas at Saltwater Creek in Tasmania celebrated the ability to enjoy the holiday outdoors, c1930. ANMM collection 00044545. Not restricted to cliché, Christmas themes or garish modern graphics, early cards served as a snapshot into the aspirations of the colonies and how colonial Australia wanted to be seen. Outdoorsy and healthy, yet still retaining a touch of the genteel. Embracing Australia’s uniqueness yet hanging on to a sense of British tradition. A country that was bursting with opportunities and untouched natural beauty. Not committed to using traditional European Christmas icons, Australian cards were diverse and celebrated many different industries and regions. This card was sent by Irish immigrant Edward Telford, to his friend in England in 1914. 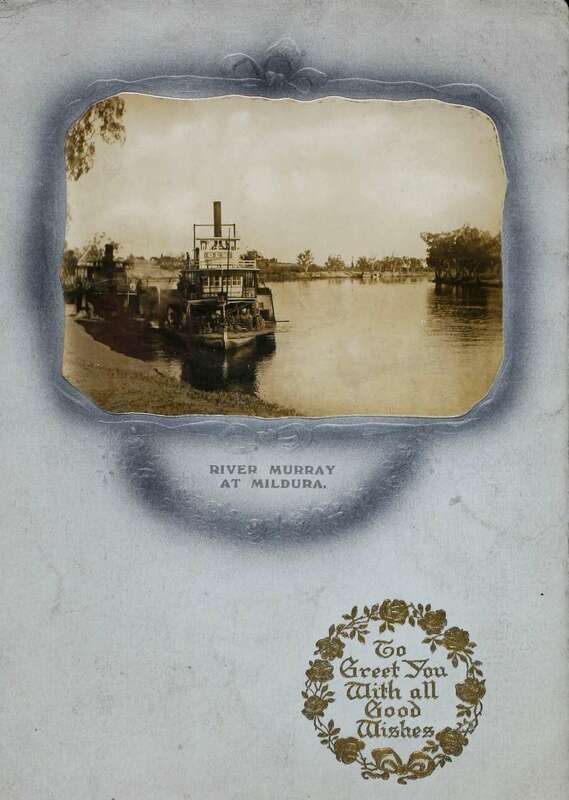 Edward notes that the weather in Mildura was ‘101 in the shade’. ANMM collection 00050150. And so, as the humble Christmas card likely fades into obscurity, I am beyond grateful that these small paper tokens of love and best wishes have found their way into the museum collection. As much for the enormous diversity and quirkiness of the images, as for the eternal messages of peace and good will they carried. 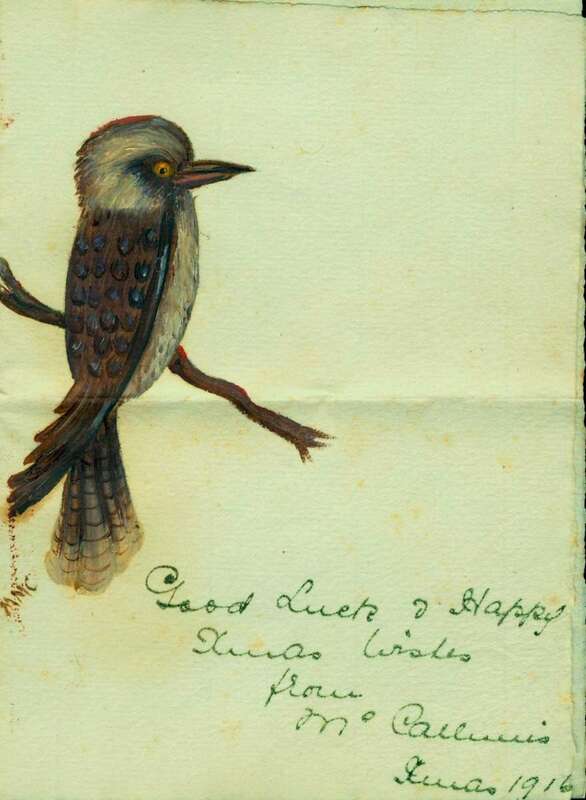 Quintessentially Australian, this hand painted Christmas card was sent to Douglas Fraser of the 1st RNBT while he was serving at Gallipoli, 1916. ANMM collection ANMS1259. Want to see more postcards and seasonal greetings from the past? Why not check out our collection online (Warning: you might lose a few hours doing this). Myffanwy is a Curatorial Assistant at the Australian National Maritime Museum.